Oil from Canada’s oil sands is now selling at a $27-per-barrel discount relative to WTI, the sharpest difference in more than four years. There are several reasons why the WCS price has deteriorated. First, the spill and shutdown of TransCanada’s Keystone pipeline in November slowed the flow of oil from Canada to the U.S. as the company was forced to make repairs. That led to a minor spike in WTI as supply tightened a bit in the U.S., but upstream in Canada it put downward pressure on WCS amid a glut of supply. 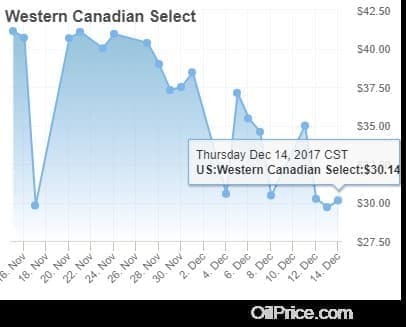 Canadian oil was diverted into storage as the pipeline underwent repairs, and the backup pushed prices down. Nevertheless, shipments of crude via rail are starting to rise again as low WCS prices have made it more attractive to U.S. refiners. But because Canadian rail is clogged up with grain at the moment, rail won’t be able to completely resolve the oil backlog.